This photo was taken in November of 2011 at 7:15 am. The "Take It!" came with no hesitation in the face of this great piece of blown glass art work. I had seen blown glass before and like it a lot. 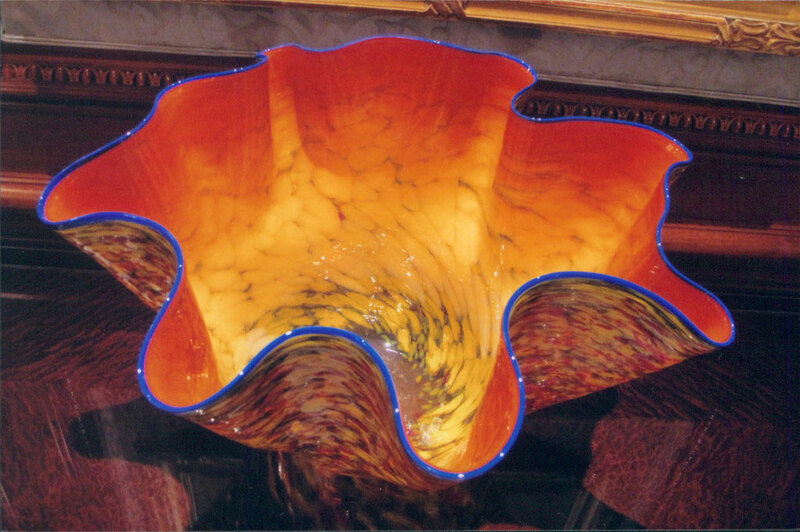 This was ever so striking as the artist chose the color orange for the body of the piece and gave it some blue accents with a solid blue border. This may be the first time I have seen orange matched up with blue and I like it very much. The After Take: Everyone that I have shown this print to has a favorable reaction to it. Most often the viewing is accompanied with a verbal expression that has the word 'beautiful' as a part of the statement. I must also say I am fond of how the overhead accent lighting does its job by casting highlights into the exaggerated ruffles in the sides of the piece. The shadows of this edge are also quite attractive. That there is a hint of light bleed through on the right side onto the polished wood surface upon which the piece sits is also quite splendid. Here is hoping you have something in your home that you have accent lit and enjoy. I am still looking in my house for just such a piece. Thanks for joining us for the current photo presentation. You are cordially invited to return Friday, September 4th for a new picture that we hope you will enjoy. PS: I think the title followed by the description leaves no confusion with that football classic. I really enjoy this pottery art style. The coloring and pattern is amazing. That would make a great cereal bowl. Lol Jake, you could eat an entire box with that thing. I really like this style too. I took a pottery class a few years ago, we learned how to make these.